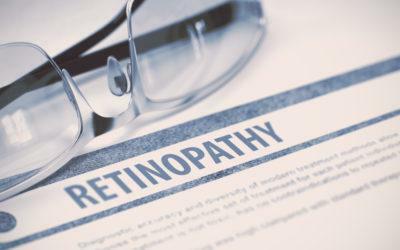 Diabetic retinopathy is a common and serious eye complication of diabetes, and it remains the leading cause of severe vision loss and blindness in working-age Americans. However, most cases of severe vision loss caused by diabetic retinopathy are preventable by maintaining good diabetes control, getting regular dilated eye examinations, and getting timely treatment if diabetic retinopathy progresses to stages that immediately threaten eyesight. See if you know the answer to this question about diabetic retinopathy. Which of the following most accurately describes diabetic retinopathy? A. High blood glucose causes the retina to detach and bleed. B. The retina loses its circulation. C. Chronic high blood glucose damages retinal capillaries, leading to fluid leakage, swelling, and growth of abnormal, new blood vessels. D. High internal eye pressure damages the retina and optic nerve. C. Diabetic retinopathy occurs when high blood glucose damages the tiny blood vessels of the retina, the thin, light-sensitive membrane lining the inside wall of the eyes. Damaged blood vessels leak blood, serum, proteins, and fats from the bloodstream, causing the retina to swell and leading to a condition called diabetic macular edema. This results in vision loss. These same damaged vessels can also release chemical signals that cause the growth of new but abnormal blood vessels that bleed profusely, causing formation of fibrous scar tissue that can detach the retina, resulting in blindness. This condition is known as proliferative diabetic retinopathy. In very severe diabetic retinopathy, the retina may detach and bleed or lose its circulation (answers A and B). But answer C describes the entire range of processes involved in the development and worsening of diabetic retinopathy. High internal eye pressure that damages the retina and optic nerve (answer D) describes glaucoma, a distinct eye disease that may be more common in people with diabetes. This question and answer was written by A. Paul Chous, MA, OD, FAAO, an optometrist specializing in diabetes eye care and education in Tacoma, Washington.